Question: What kind of battery does the V-Logger use, and how do I replace it? Answer: The standard battery is a size D lithium battery, and should be replaced using the information detailed here. It is a 3.6v lithium battery. The preferred manufacturer is Xeno Energy. They sell the battery under part number #XL-205F (a secondary manufacturer also makes them: Tadiran, under part number #TL-5930 (TL-5930/S)). They can be purchased from several online retailers, including Amazon and Sears, as well as at battery specialist stores. Question: How do I update the firmware for my V-Logger? Answer: Updating the firmware for a V-Logger is a simple process. 1. Download and save the V-Logger firmware update here. 2. 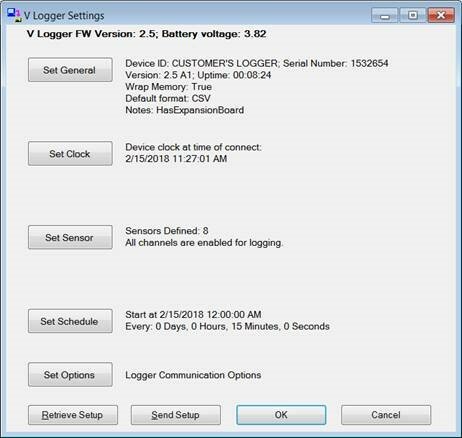 Connect the logger to your PC via USB and run Logger Manager. 3. Select device type “V Logger” and verify that you have the correct Comm Port selected. 4. If needed, save all data and settings before updating the firmware. 6. Click “Upload Firmware” and navigate to the firmware update file you saved in Step 1. Select the *.bin file and press OK.
7. The Update window will open, showing the progress of the firmware update. 8. 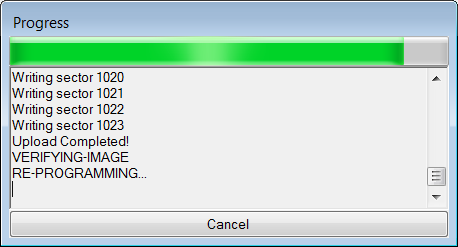 When complete, the “Set Clock” window will open; it may or may not be necessary to update the clock. 9. Confirm the firmware version by clicking “Set Up” on the Logger Manager home page. Click “Retrieve Setup”. Check the Version shown in the general settings. The current version is 2.5 A1. – Always update with a USB connection. Do not update firmware via a radio link. – The firmware update will fail if the logger starts to log a reading during the upload. If necessary, change the logging interval so that it will not interfere with the firmware update.